Automatic Email Processor is the complete solution for Outlook to store and print incoming emails and their attachments automatically. For this, various filters, flexible configuration options, such as individually definable storage folders and the possibility of subsequent processing are available. For example, the path of the location where you want Automatic Email Processor to save certain emails or email attachments, can be assembled dynamically from individual properties of an email. For storing email messages, inter alia, the output format can be specified (for example, PDF, RTF, or HTML). 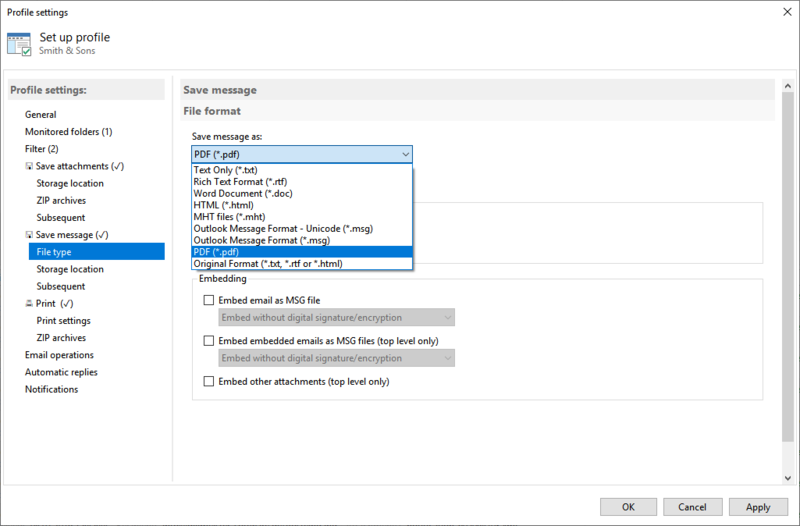 The Outlook message format (MSG files) is for example particularly suitable to back up e-mails. The program supports the creation of an unlimited number of rules to allow separate settings for different email accounts. Rules can be additionally applied to emails of a specific time period or to any previously received emails of an Outlook folder. Automatic Email Processor monitors Outlook and allows you to send emails or attachments that meet previously defined criteria to a printer directly after receipt. 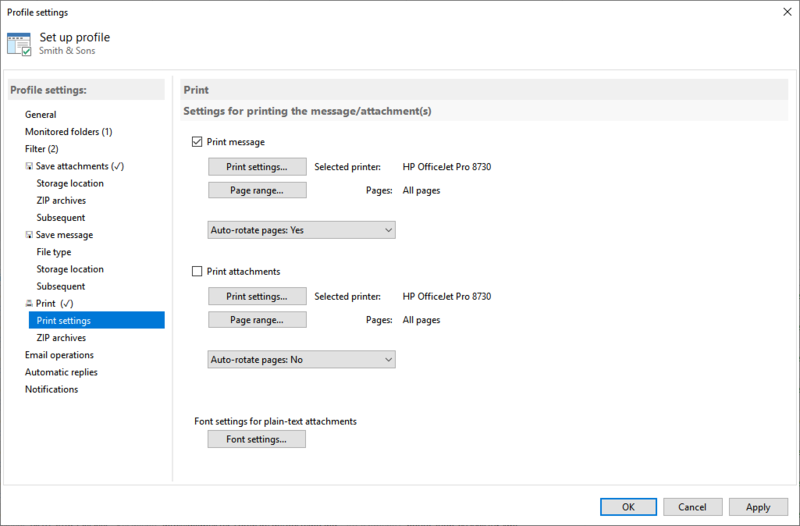 Different settings for each rule can be made for the print output, in order to, for example, be able to print specific emails in a different quality. The respective printer can be individually defined for each rule as well as separately for the printing of the email message or the attachment. With Automatic Email Processor, emails received in Outlook can automatically be saved into a specified directory as PDF file, for example, in order to keep a copy of the message for backup purposes. Attachments and the email itself can also be embedded (as MSG file with or without digital signature) in the PDF file. The path as well as the folder and file name of the PDF file to be saved can be composed of various properties of the email, such as the date and, for example, a part of the subject. For whom is the program suitable? The program is aimed at users who frequently or at regular intervals receive emails with Outlook whose message and/or attachments should be archived or automatically processed. This can be, for example, the monthly bill that should be printed immediately after arrival or a ZIP file, which should be stored in a specific directory and then handed over to a specified program as parameter for further processing. Especially on a large number of incoming emails, a manual inspection and sorting of emails binds a lot of work performance and can take a long time to complete. Automatic Email Processor can perform these tasks after a single set up automatically in the background, saving you time. 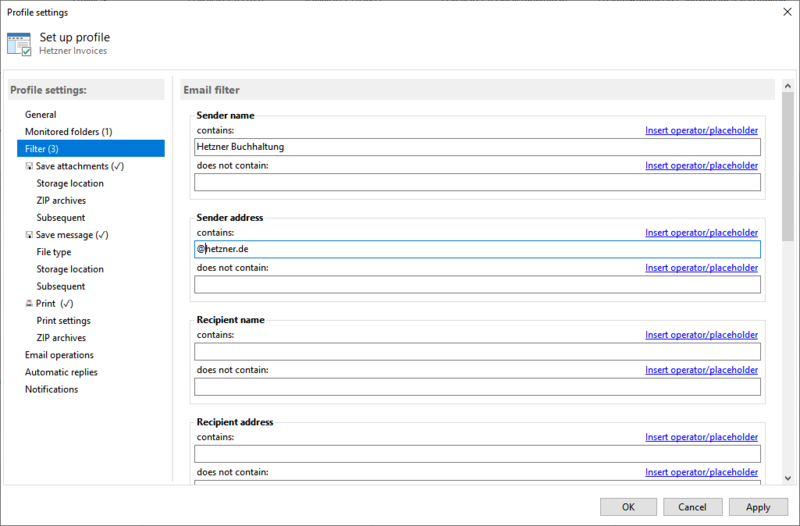 Automatic Email Processor provides flexible filters to limit the emails to be processed by their attributes. All criteria can be combined with each other. If all filter criteria are fulfilled, the task of the respective rule is executed (for example, the relevant email is converted to a PDF file or all the attachments are stored). For example, you can specify that only PDF files should be saved or printed directly, which also contain a specific word in the attachment file name and come from a particular sender. The software is easy to configure and offers through the support of multiple rules the option to define flexible filter rules that are applied individually to an Outlook email account. 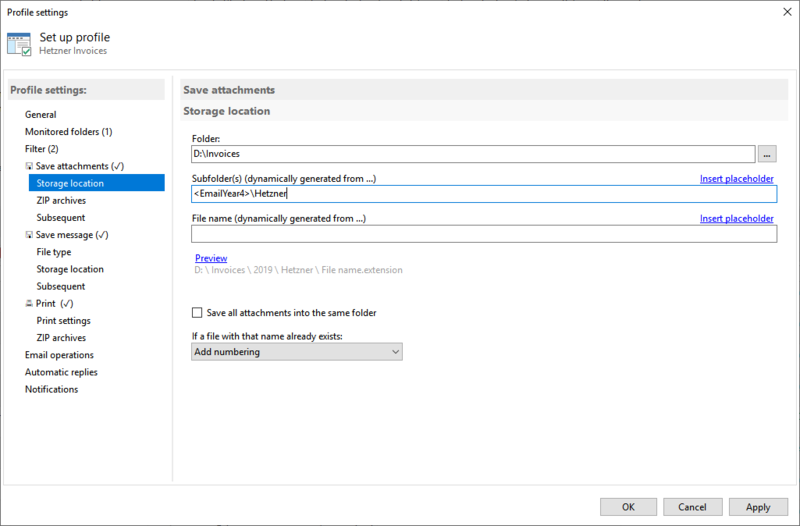 Since you can also create multiple rules for any Outlook email folder, emails and email attachments can be stored, for example, in different/multiple directories. Also, an email can be processed multiple times by different task types. For example, a task can be created to save all attachments of an email and to store the email message automatically as PDF file, and another one to print two copies of the message immediately after receiving. If required, the location where an email or email attachments are saved can be assembled dynamically from different email properties. 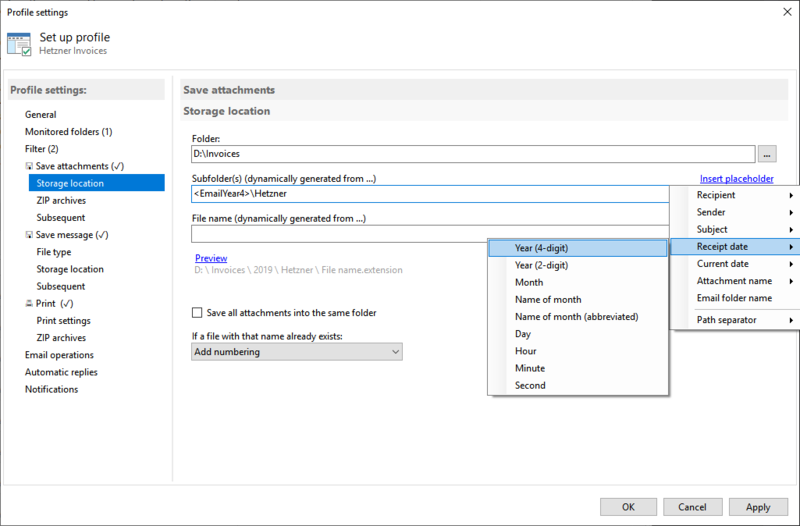 For example, the receipt date of the email or the name of the sender can be used as a subfolder. Furthermore, for email attachments, a part of the attachment file name can be used for the folder or file name of the attachment to be saved.